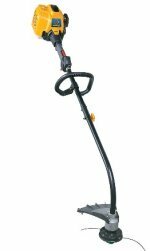 Cub Cadet String Trimmer is part of a large line of excellent power equipment provided under the Cub Cadet line. Customers hold this brand close to their hearts, and for good reason. Cub Cadet has dealt with the emissions problem inherent in small 2 cycle engines by providing both a 4 cycle and 2 cycle engine design. The 4 cycle engines do not require oil to be mixed with the gas, but there are more moving parts in the engine to contend with. Engine weight tends to be higher, also. Two of the cub cadet string trimmer models are powered by the 4 stroke engine engine design. This is a ‘bare bore’ design, with 3 piston rings to help maintain good compression and power. Both models that are powered by the 4 cycle engines feature curved shafts. Cub Cadet also offers an electric trimmer with a rechargeable battery. Cub Cadet string trimmers has the 2 basic versions - straight shaft and curved shaft. The straight shaft trimmers are higher priced, and generally more powerful. Starting with the curved shaft trimmers, the Cub Cadet Model CC 2020 is a standard homeowner trimmer equipped with 31cc displacement 2 cycle engine. The cylinder is ‘bare bore’ ( less durable), and the piston has 2 piston rings. The crankshaft is a ‘half-crank’, describing the fact the shaft is supported on only one side by bearings mounted into the crankcase. If you are a homeowner using this machine, you are protected by a 3 year warranty. A small bump head allows for the line to be fed out of the head when needed. The cost of this economical unit is $110.00 . The straight shaft version is Cub Cadet Model ST 2080 and costs about $160.00. Next in the curved shaft line is the Cub Cadet Model ST 227C . The best built curved shaft 2 stroke trimmer in the Cadet line, it is powered by 27cc displacement 2 cycle engine. The engine features a chrome bore cylinder and two ring piston. The crankshaft has been extended to a full length, and is supported on both ends. A 3 year warranty for homeowners is standard. The cost of this mid-range homeowner machine is about $180.00 . Prefer to have a straight shaft trimmer with the same engine? The Cub Cadet Model ST 227S will cost about $200.00. One of the curved shaft trimmers is powered by a low emissions 4 cycle engines. The Cub Cadet Model ST 428C has a full crank, 3 piston ring engine with a bare bore cylinder. The bump head is the Speed-Spool Pro design, that allows you to get that head loaded quicker. A 3 year warranty for homeowners is standard. The cost of this mid-range homeowner machine is about $220.00. Prefer a straight shaft? The Cub Cadet Model ST 4286S will cost about $240.00. Two straight shaft trimmers that sport 4 cycle engines include the Cub Cadet Model ST 4175 and the Cub Cadet Model BC 5090. Both feature an engine with a half crankshaft design. The pistons are equipped with three ring pistons in either case. The model ST 4175 has a cast iron sleeve for durability, and a fixed line feed head. The handle is the professional J-handle design. Warranty remains 3 years for homeowners, and costs $190.00. The model BC 5090 is the highest priced Cub Cadet trimmer, weighting in at $220.00. The cutting head is a large bump style. Cub Cadet has proven to be a popular brand with the homeowner. Lower priced than many of its competitors, they are well suited for those looking for a good trimmer on a budget.